Just putting a Kindle Paperwhite in a child’s hands is probably not going to turn him or her into an avid reader overnight. However, if you encourage your child to take advantage of the various features of the Kindle Paperwhite to personalize their device and make reading fun, you can help nurture a reading interest and make it flourish into an enjoyable hobby and lifelong habit. For starters, you can show your child how to change the font, font size, line spacing, and margins to customize the screen for the best reading experience. Show them how to adjust the light for different lighting conditions. Take advantage of the teachable moment to explain why you want a brighter light in a brightly lit area versus a dimmer light in low light conditions. 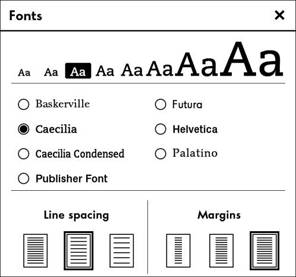 Remember, you change the font, font size, line spacing, and margins from the same menu. Tap at the top of the screen, and then tap the icon shown in the margin to display the Fonts menu. Dictionary and X-ray are powerful features that can also spur an interest in reading. Children are often discouraged by reading because they don’t understand the words or are confused by locations and characters. Teach them how easy it is to look up a word by simply long-tapping — the dictionary will open and display the definition. X-ray is helpful as a refresher of characters and places. Translation is another feature that children find intriguing. From the dictionary page, tap More, and then tap Translation. Remember that the Kindle Paperwhite can provide translations of a word into 16 languages, from Chinese to Spanish. Give your child a challenge: Choose a common word, such as Thanks, and translate it into several languages. Which ones are similar? Which ones are different? Which ones don’t even look like English? Remember that every time a word is accessed in the dictionary, it is added to a running list of words in Vocabulary Builder. Within a book, this list is accessed by tapping Menu→Vocabulary Builder. Show your child how to sort the list by word or by book. Have your child tap Flashcards to practice a definition and see the word used in context, and then tap Mark as Mastered to remove the word from the Flashcard list. 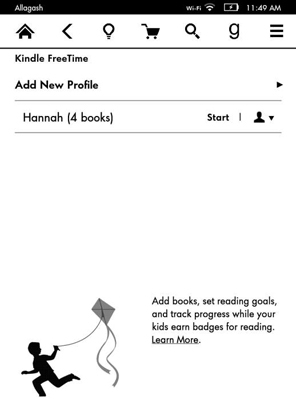 The Kindle Free Time application, which is available for the Kindle Paperwhite and Kindle Fire, allows you to create individual profiles for your children and customize a reading goal of minutes per day with badges and rewards. As a parent, you can access a progress report that lets you see the total time spent reading, badges earned, and books finished. 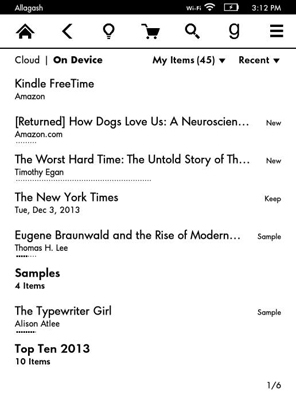 Kindle Free Time lets you designate books your child can access from your Cloud at Amazon. Kindle Free Time is activated when you set a password for parental controls. To access parental controls, tap Menu→Settings→Device Options→Parental Controls. Tap Kindle Free Time and the screen shown in the figure below appears. Follow the on screen instructions to add a profile for your children. You can add books from the Cloud to their individual profiles. When reading in Kindle Free Time, the Goodreads icon on the toolbar is replaced by a badge. Tap the badge to access a variety of goals, such as Book Worm (30 minutes of reading) or Super Book Worm (reading 30 minutes a day for 7 days). In some ways, Kindle Free Time mimics parental controls, however, Kindle Free Time blocks these features only when Kindle Free Time is turned on and a child is reading within his or her profile. When Kindle Free Time is exited — which must be done by reentering the password you selected — these features are reactivated. 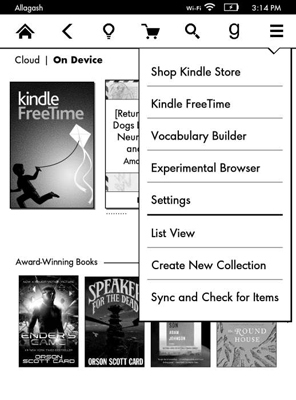 After Kindle Free Time has been activated on your Kindle, it appears as a menu choice on your Home screen, and it also becomes a menu choice when you tap the Menu icon. Kindle Free Time appears as an option on the Home screen. Kindle Free Time appears as a menu choice. Older children may read books with footnotes. The Kindle Paperwhite makes it much easier to look up footnotes than earlier versions of the device. Simply tap the superscripted number or the footnote mark to open the page in Footnote. To exit the footnote, tap the X in the upper-right corner. 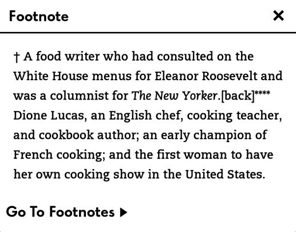 To read all the footnotes in a book, tap Go to Footnotes.